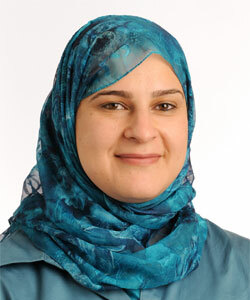 Manal Omar serves as Director of Iraq, Iran, and North Africa Programs at the United States Institute of Peace's Center for Post-conflict Peace and Stability Operations, which she joined in 2008. She previously worked with Oxfam - Great Britain as a Middle East program manager and with Women for Women International as regional coordinator for Afghanistan, Iraq, and Sudan. Omar worked with UNESCO in Iraq from 1997-98 and as part of the World Bank's development group carried out training programs in Yemen, Afghanistan, Lebanon, Kenya, and elsewhere. Her publications have appeared in Guardian, Washington Post, and Azizah Magazine, and her memoir, Barefoot in Baghdad (2010), chronicles her work with women in Iraq. In 2007, Islamic Magazine named her one of the ten young visionaries shaping Islam in America. She holds an MA from Georgetown University and a BA from George Mason University.